If you are looking for the best Hurghada excursions while you are on holiday in Egypt, you are in the right place. Hurghada was once a small village and has become one of Egypt’s most popular tourist destinations thanks to holiday makers who want a vacation at the illustrious Red Sea. 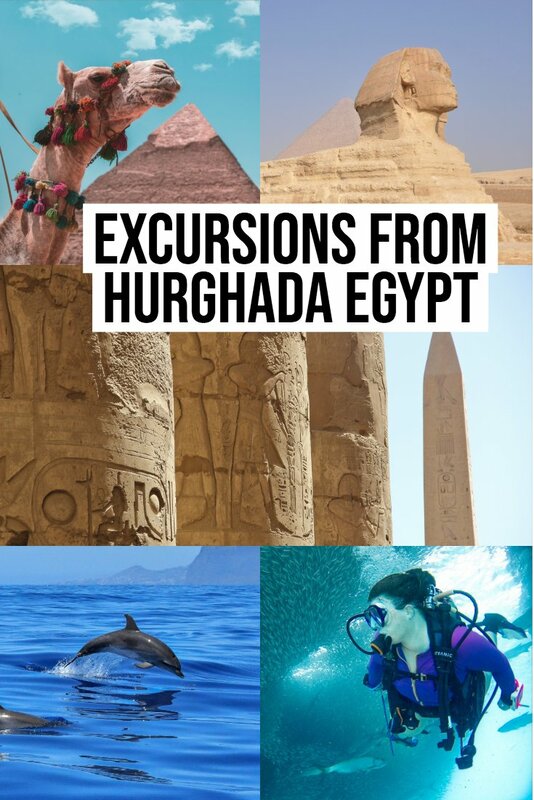 If you are visiting the Red Sea and are interested in one of the many Hurghada tours being offered, continue reading for the best Hurghada excursions worth your money. If you want to swim with the dolphins then this Dolphin Snorkelling Tour from Hurghada is one of the best things to do in Hurghada! This all day tour will pick you up from your hotel in Hurghada and drop you off after your tour. If you are staying in Makada, Sahl Hashesh, Soma Bay, El Gouna and Safaga, you can also get a hotel pickup for an extra fee. The reason why I love this Hurghada snorkelling trip is that you not only get great snorkelling, you get to swim with the dolphins in the Red Sea on your Egypt holiday! The tour includes lunch and drinks, water, snorkelling equipment (and life vests for those who might not be as comfortable in the water) and a well equipped boat. Bring your bathing suit, towel, sunscreen, and a waterproof camera! 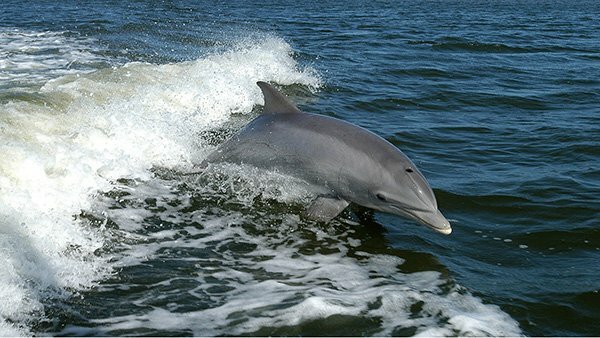 While the reviews all mention great dolphin sightings, just remember that you are going to see animals in the wild, and they may not always be where the captain expects to find them! It is possible to visit Luxor as one of the Egypt excursions from Hurghada. We loved our visit there and next time, I think we would stay a week! Any visit to Egypt needs a visit to the Valley of the Kings and this Luxor day trip from Hurghada is a great option! Included in your tour is pickup from El Gouna, Hurghada, Sahl Hasheesh, Makadi and Safanga. It is a long day, the tour is 16 hours, but worth it to get a glimpse of Luxor. On this tour you will visit the Temple of Karnak, the Colossi of Memnon, the Valley of the Kings, the temple of Hatshepsut. 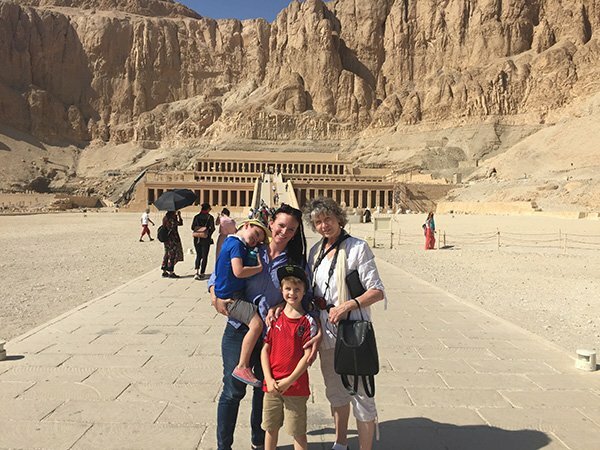 The is one of the popular trips form Hurghada and the tour includes lunch, entrance into the sites (your valley of the kings visit includes access to three burial chambers, and be sure to read my post about Valley of the Kings tour, so you know what to expect.) Drinks and Tips are not included, either is the felluca ride across the Nile. What to pack on Hurghada day trips to Luxor? Bring a hat and sunglasses as the sites are very sandy and bright. Also make sure you have comfortable shoes. Water is provided on the tour, but it can be a long day, so I always have one on hand, as well as a few snacks. Do not forget your camera. If you are traveling in the cooler months, dress in layers. If you want to read reviews, you can check them on Trip Advisor here. Trip Advisor also sells tours now, which makes it an even more valuable platform. The Hurghada quad tour includes an adrenaline rush quad ride into the desert, as well as time in a bedouin camp, dinner and shisha! If you want to get out into the desert and have a bit of an adrenaline rush, check out this half-day Hurghada quad tour. You will be picked up from your hotel and transferred to the quads. It is a 30 km exhilarating ride into the desert to a nearby Bedouin village. For anyone who is not a confident driver, you can ride tandem with a guide. Here is another Hurghada Quad Tour you can check out and compare which one better suits your needs! A trip to Cairo from Hurghada includes a visit to the Pyramids of Giza, the Sphinx and the Egyptian Museum. You cannot take an Egyptian vacation without seeing the real history of the country! While this trip is 20 hours in length, it is my recommendation. 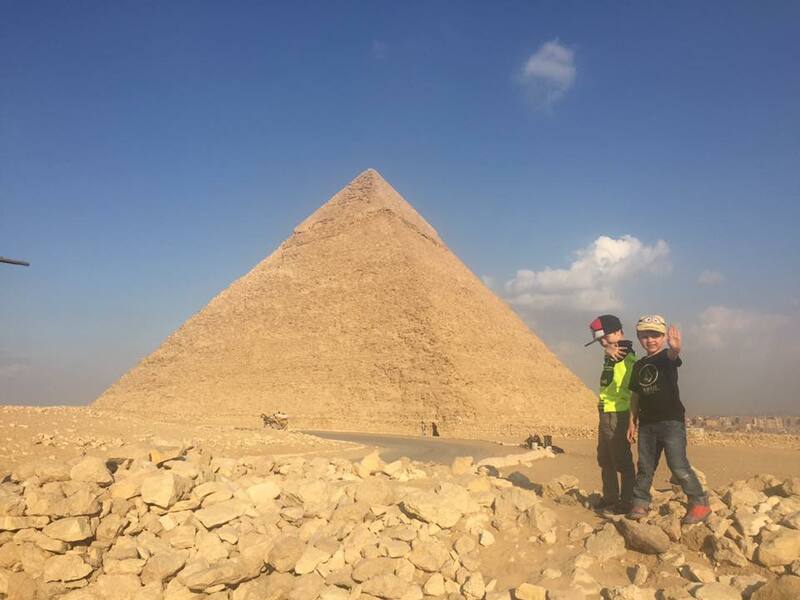 The Hurghada Pyramids Day Trip . 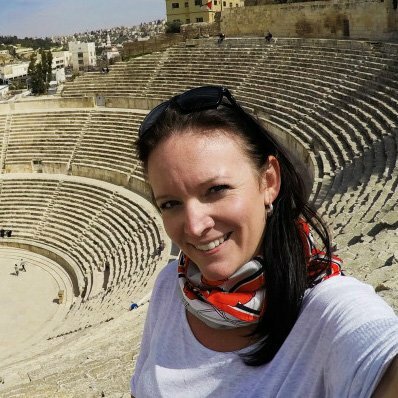 No trip to Egypt is complete without visiting the last surviving 7 Wonders of the Ancient World. On this tour to Cairo and Giza, you visit the Pyramids of Giza, see the antiquities at the Egyptian Museum, including the treasures of King Tut. If you want to go into the Mummy room, there is a small surcharge. After the museum you will visit the pyramids and the Great Sphinx. 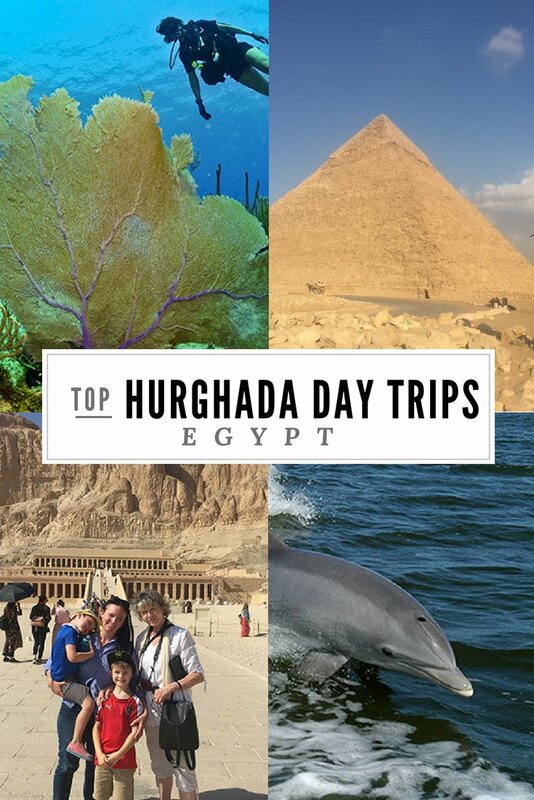 At over 4500 years old this is one of the day trips from Hurghada that you should not miss! 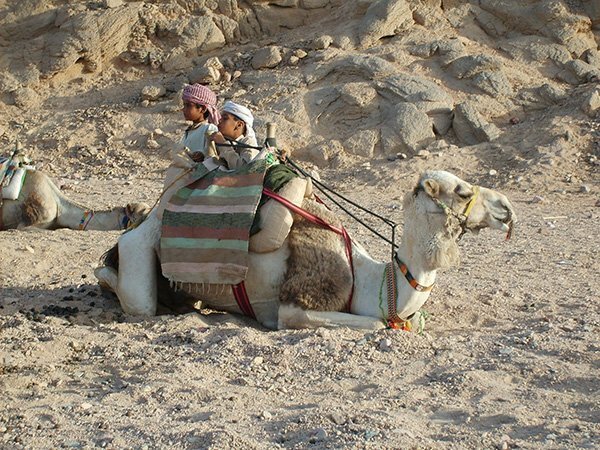 If you choose to go inside the pyramids or ride a camel or horse, there is a separate charge, ask your guide for help. The vendors are quite a hassle in Giza. 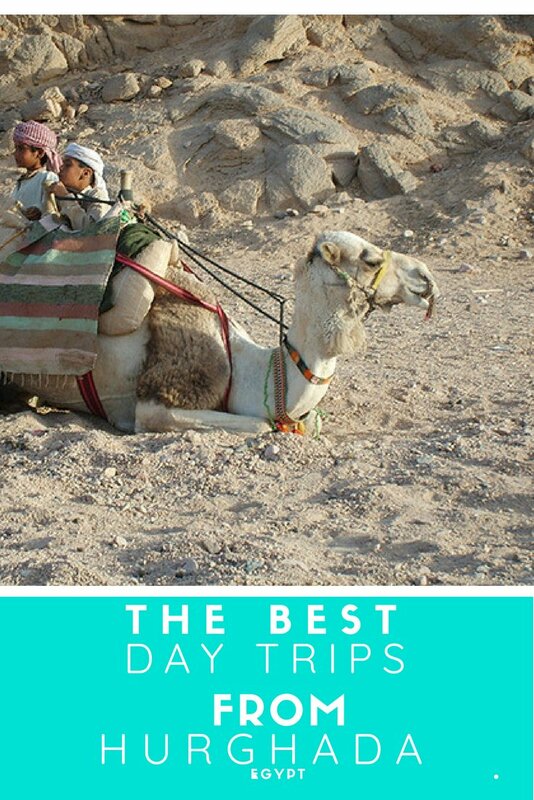 This tour includes pick up from your hotel, a guide, entrance fees to the Pyramids and the Museum and lunch. It does not include additional food and drinks and tips. Note that this is a long day. You are picked up pretty much in the middle of the night for this trip. However, you should not miss the Pyramids of Giza when you visit Hurghada and this is an economic and comfortable way to do it! If you are not into a long bus ride, you can visit the Pyramids from Hurghada by Plane on this tour. It is still a long day, but less time sitting on a bus! It all depends on your travel style! One of the best Hurghada Excursions is into the jewel blue waters of the Red Sea. 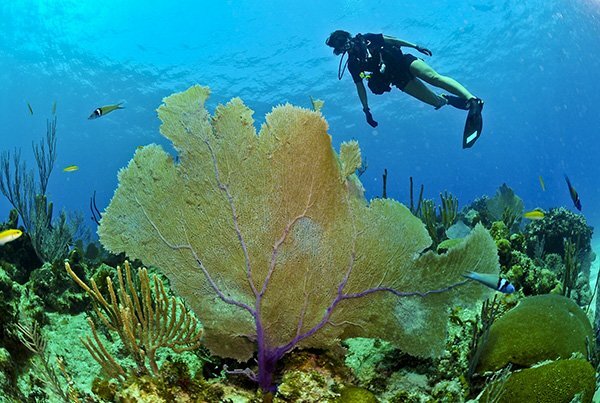 If you are new to diving, this might be the place to try! If you ever thought you wanted to try scuba diving, Hurghada is a place to try it. Because of its location on the Red Sea, snorkelling and scuba diving are among the popular Hurghada activities. This tour is for beginners, and they ask for an additional supplement for certified divers who want professional equipment. You can also check out this tour. the both offer hotel pickup, a boat trip with two different dive sites, basic equipment and lunch. If you want professional equipment there is a 10 Euro surcharge that can be paid on the tour. If you have never visited outside the resort areas of Egypt, be sure to read my post on Things to know before visiting Egypt and this post on Is Egypt Safe? They should help ease any fears and let you know what to expect. Also check out 10 things to buy in Egypt to give you a good idea of what is available and what to keep your eye out for! If you are wondering what to wear outside the resort area of the region, this post on What to Pack for Jordan will give you a good idea. Yes, I wrote it for Jordan, but most of it applies to pretty much everywhere I have been in the Middle East.